compliance to all legally binding requirements, especially LFGB (German Law on Food and Feed), the EU Hygiene Package and national provisions, as well as our own HACCP system. the systematic promotion of hygiene awareness with courses and workplace training. ongoing microbiological inspections of products and workplaces. Our quality management system is based on the requirements of the IFS certifications and DIN EN ISO 9001:2000 "Quality management systems - Requirements", which we implement in compliance with the IFS specifications on the requirements of quality management manuals and the contents of DIN EN ISO 9004:2000 "Quality management systems - Guidelines for performance improvements". 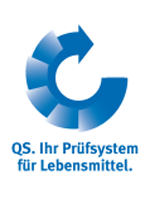 Our Frechen site is also certified according to DIN EN ISO 50001:2011. Documented inspections, division manager and cleaning checklists, appropriate workplace courses and training programmes for all our employees ensure that standards are enforced and implemented. We rely on a pool of established suppliers who take their obligation towards consumers as seriously as us. We ensure that our partners comply with valid norms and work according to the principles of sustainability. All processes between goods receipt and goods issue are carefully inspected by Boeser. The provenance of our goods is traceable because this digital aspect of quality assurance is also compulsory. With the help of a QR code, you can track the meat's journey back to the animal's region of origin straight while at the supermarket.